In this post, we talk about designing a cloud-native data warehouse as a replacement for our legacy data warehouse built on a relational database. Based on these requirements, we decided to change the data warehouse both operationally and architecturally. From an operational standpoint, we designed a new shared responsibility model for data ingestion. Architecturally, we chose a serverless model over a traditional relational database. These two decisions ended up driving every design and implementation decision that we made in our migration. As we moved to a shared responsibility model, several important points came up. First, our new way of data ingestion was a major cultural shift for Woot’s technical organization. In the past, data ingestion had been exclusively the responsibility of the data warehouse team and required customized pipelines to pull data from services. We decided to shift to “push, not pull”: Services should send data to the data warehouse. AWS Glue handles our ETL job scheduling. 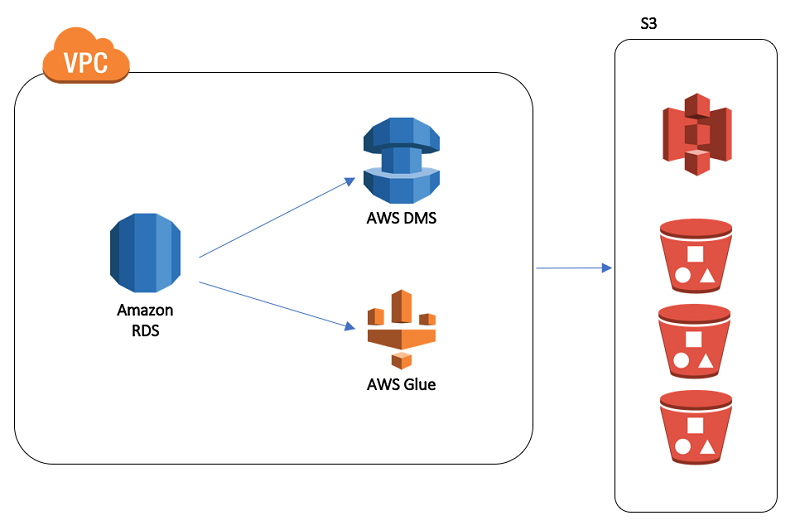 AWS Glue crawlers manage the metadata in the AWS Glue Data Catalog. Crawlers are the “secret sauce” that enables us to be responsive to schema changes. 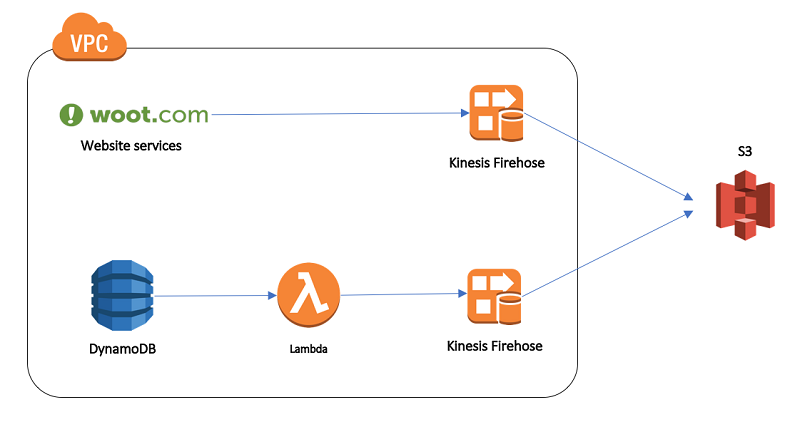 Throughout the pipeline, we chose to make each step as schema-agnostic as possible, which allows any schema changes to flow through until they reach AWS Glue. However, raw data is not ideal for most of our business users, because it often has duplicates or incorrect data types. Most importantly, the data out of Firehose is in JSON format, but we quickly observed significant query performance gains from using Parquet format. Here, we used one of the performance tips in the Big Data Blog post Top 10 performance tuning tips for Amazon Athena. With our shared responsibility model, the data warehouse and BI teams are responsible for the final processing of data into curated datasets ready for reporting. Using Lambda and AWS Glue enables these teams to work in Python and SQL (the core languages for Amazon data engineering and BI roles). It also enables them to deploy code with minimal infrastructure setup or maintenance. Series of conditional triggers that control the flow of subsequent jobs that depend on previous jobs. A similar pattern across many jobs of reading in the raw data, deduplicating the data, and then writing to Parquet. We centralized this logic by creating a Python library of functions and uploading it to S3. We then included that library in the AWS Glue job as an additional Python library. For more information on how to do this, see Using Python Libraries with AWS Glue in the AWS Glue documentation. The AWS Glue use of PySpark simplified the migration of these queries, because you can embed SparkSQL queries directly in the job. Converting to SparkSQL took some trial and error, but ultimately required less work than translating SQL queries into Spark methods. However, for people on our BI team who had previously worked with Pandas or Spark, working with Spark dataframes was a natural transition. As someone who used SQL for several years before learning Python, I appreciate that PySpark lets me quickly switch back and forth between SQL and an object-oriented framework. Another hidden benefit of using AWS Glue jobs is that the AWS Glue version of Python (like Lambda) already has boto3 installed. Thus, ETL jobs can directly use AWS API operations without additional configuration. For example, some of our longer-running jobs created read inconsistency if a user happened to query that table while AWS Glue was writing data to S3. We modified the AWS Glue jobs to write to a temporary directory with Spark and then used boto3 to move the files into place. Doing this reduced read inconsistency by up to 90 percent. It was great to have this functionality readily available, which may not have been the case if we managed our own Spark cluster. After we had all the datasets in place, it was time for our customers to come on board and start querying. This is where we really leveled up the customer experience. Previously, users had to download a SQL client, request a user name and password, set it up, and learn SQL to get data out. Now, users just sign in to the AWS Management Console through automatically provisioned IAM roles and run queries in their browser with Athena. Or if they want to skip SQL altogether, they can use our Amazon QuickSight account with accounts managed through our pre-existing Active Directory server. Integration with Active Directory was a big win for us. We wanted to enable users to get up and running without having to wait for an account to be created or managing separate credentials. We already use Active Directory across the company for access to multiple resources. Upgrading to Amazon QuickSight Enterprise Edition enabled us to manage access with our existing AD groups and credentials. Our legacy data warehouse was developed over the course of five years. We recreated it as a serverless data lake using AWS Glue in about three months. In the end, it took more upfront effort than simply migrating to another relational database. We also dealt with more uncertainty because we used many products that were relatively new to us (especially AWS Glue). How intuitive and beautiful Amazon QuickSight is. They love that no setup is required—it’s easy enough that even our CEO has started using it! 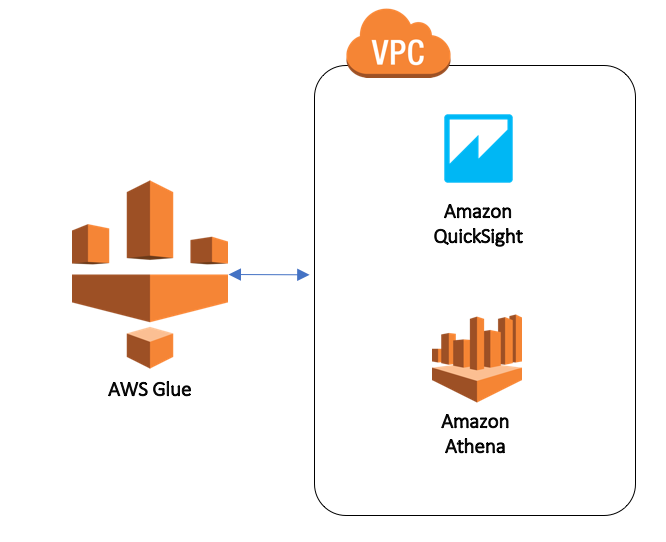 That Athena plus the AWS Glue Data Catalog have given us the performance gains of a true big data platform, but for end users it retains the look and feel of a relational database. From an operational perspective, the investment has already started to pay off. Literally: Our operating costs have fallen by almost 90 percent. Personally, I was thrilled that recently I was able to take a three-week vacation and didn’t get paged once, thanks to the serverless infrastructure. And for our BI engineers in addition to myself, the S3-centric architecture is enabling us to experiment with new technologies by integrating seamlessly with other services, such as Amazon EMR, Amazon SageMaker, Amazon Redshift Spectrum, and Lambda. It’s been exciting to see how these services have grown in the time since we’ve adopted them (for example, the recent AWS Glue launch of Amazon CloudWatch metrics and Athena’s launch of views). We are thrilled that we’ve invested in technologies that continue to grow as we do. We are incredibly proud of our team for accomplishing this ambitious migration. We hope our experience can inspire other engineers to dive in to building a data lake of their own. How do I deploy a data lake on AWS? Chaya Carey is a data engineer at Woot.com. At Woot, she’s responsible for managing the data warehouse and other scalable data solutions. Outside of work, she’s passionate about Seattle’s bar and restaurant scene, books, and video games. Karthik Odapally is a senior solutions architect at AWS. His passion is to build cost-effective and highly scalable solutions on the cloud. In his spare time, he bakes cookies and cupcakes for family and friends here in the PNW. He loves vintage racing cars.